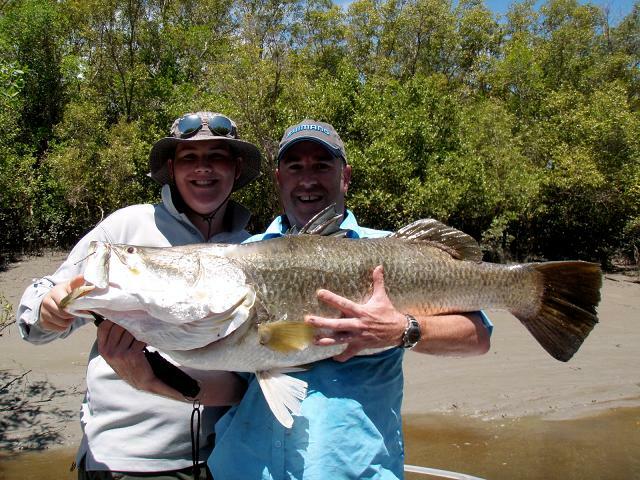 When I first fished the Northern Territory in 1999 and caught my first Barra (a 68cm in Howard River, Shoal Bay), it didn’t take me long to work out that the holy grail of Barra is to join what’s commonly known as ‘The Meter Club’ and catch a wild Barra equal to or over one meter in length. In the years that followed I vividly recall catching Barra in the 90’s, the biggest being 98cm at Clear Creek on the Daly River in 2001, you see, these are significant moments in the life of an angler which can be recalled with great accuracy and fond memory. I forget people’s birthdays, but I recall all these fish. When I mentioned to a few mates that I’d be joining the queue of boats heading to Shady Camp (on the Mary River system) for the annual opening of the season, I got mixed reactions. “Too much water mate”, one said and “We did no good there last year at that time”, another offered. I didn’t care for two reasons – first, I saw fish being caught there last year at the same time, and secondly, I had already told my wife that this was the day I would get a meter Barra. As her eyes rolled, I hooked the boat up and headed for Shady Camp with a couple of good mates. 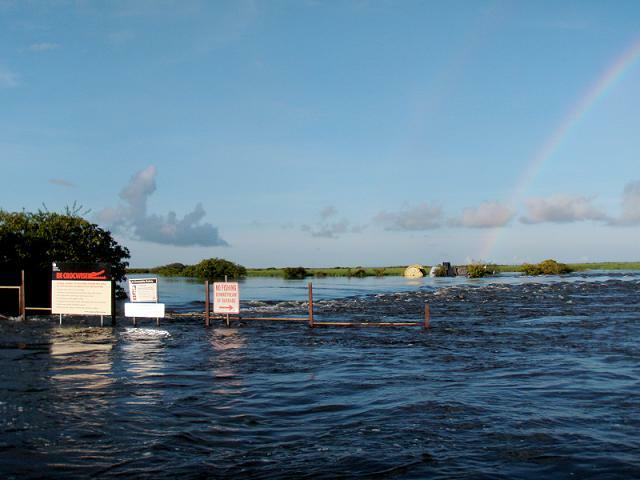 A few hours later, we launched under a spectacular rainbow and a flood of water indicative of the Northern Territory wet season. Shady Camp, as the name suggests, has very little shade and is situated on the Mary River system, a vast expanse of wetland and flood plain swarming with bird and wildlife, dotted in man made barrages and home to one of the most prolific Barramundi populations in Australia. 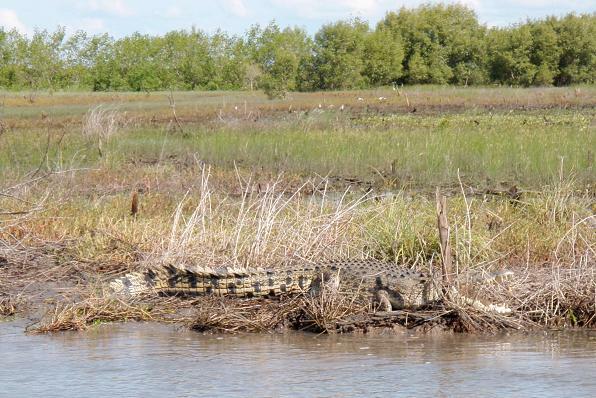 It also boasts the highest population of saltwater (or Estuarine) crocodiles per square meter, in the word. It is a part of the Northern Territory I love being in, regardless of the catch. For the locals reading this post, we launched at the car park around 7:15am with a view to fishing the top (that is, between the first and third barrages). This plan was quickly discarded with the water roaring over the main barrage making trolling anywhere in the first few kilometres impossible. The road in was pretty good, a bit rough towards the middle few kilometres and clearly not graded at this stage. To the mouth it was, and the 45 minute journey towards the ocean was an easy one as we spotted the usual healthy population of crocodiles, birds (some huge eagles and Jabirus) and an amazing number of water borne snakes. A few casts along the way at some run-off in the final third of the river (before the mouth) and a good session, although no fish boated, at a creek about 5kms from the mouth. Interestingly, a few gatherings of passing bait fish, some birds ready for feeding, and a clearly knowledgeable crocodile suggested that this creek was ready to fire with Barra. Observing nature is worth so much, and on this occasion, lead to the inevitable conclusion of Barra boofing, a dropped 65cm fish, plenty of hits but none in the boat. It passed very quickly, and as the tide ran out, we concluded that that the bait and Barra were running with it towards the mouth. As we continued towards the mouth of Sampan Creek, we started to theorise about exactly where the 25 boats, belonging to the 25 trailers and cars in the car park at launching, were fishing. Expecting to see most of them at the mouth, we were surprised to see only three. 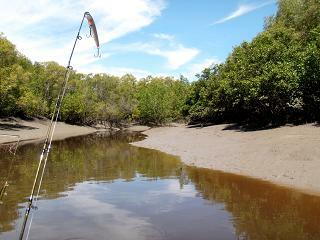 It didn’t take long to figure out (by chatting to other fishos) that most were around the corner at Tommycut Creek, a handful were midway between the mouth and the boat ramp, and some were trying the other coastal creeks. One of the hardest parts of fishing for Barra is to undertake proper research to match the time of year and the tides, come up with a plan, and then stick to that plan. Our agreed plan was simple, namely, troll the Sampan Creek mouth over the turn of the low tide, and then leave. This was especially pertinent as one of my mates had negotiated his ‘leave pass’ by agreeing to a rough return time. As we know, brownie points are hard earned and wasting them on late returns without fish is like paying interest on a credit card. The day was tough and extremely hot on the water. Two and a half hours trolling around the mouth with not even a hit and plenty of sunburn. As other boats started to come in from the coastal creeks, the fact that they were stopping for a chat indicated that not much was happening. We spoke to most, and very few managed any fish. We trolled the turn of the low and decided to call it a day. As with all fishing trips where nothing is caught, the conversation during the trip back to the boat ramp revolved around how nice the nature was, how good it was to be out of the office for a day, and how ‘a bad day’s fishing is better than a good day at work’ – it’s the comfort food equivalent for fishos, we all do it, we all get it. As we motored back from the mouth, a few kilometres up the river I couldn’t help noticing a creek which was echoed on the GPS by another series of creeks. “Lets have a look”, I suggested. On first look, it presented like a textbook Barra fishing scenario. We had left the turn of the tide at the mouth, the low was therefore pushing back upstream, and there was the most distinct of colour changes showing across this creek. On one side, tannin water and on the other, the dirty tidal waters of a mid-wet season. It was worth a go. After commencing the slow troll it was a matter of minutes before I felt the hardest hit on the largest sized green Bomber lure. It didn’t jump, it just rolled over showing a massive thick back and a paddle tail the size of a dinner plate. As the driver of the boat, I slipped it into neutral and started to fight what I thought was an 80 or 85cm fish. It ran hard, and headed straight for a snag behind the boat. Throwing trust to the knot, braid and leader, I locked the reel up and reefed the head of this massive fish around and back towards the boat. One mate, Davis, had the net ready. The other mate, Bernd, had the rest of the boat (and me) under a calming control. As I continued to fight this fish, the brute force was incredible. On its run, the fish felt unstoppable and as it approached the boat, it regained further strength. As I finally manoeuvred it away from the snag and around to the awaiting net, it swam on cue into the net. Davis started to lift the net by the handle and then it happened – the net broke at the handle under the strain of 28 kilograms of Barra weight. When you get a fish in the net, it is usually a sign that the job is almost done and that the catch is finished, but not this time. The handle sank, and so too did the net with the Barra in it. In a reach of desperation, Davis leaned over the side of the boat, grabbed the net with two hands and hauled the net and fish over the stern and onto the deck. I’m not sure whether it was the crocodile populated river or the fact that he knew it was a meter Barra that motivated him to act so quickly, either way, he saved my meter fish. Still shaking from the whole event, I managed to free the hooks and lift this monster of a 111cm Barra up for a few quick photos. 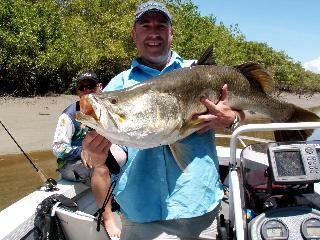 All Barra this size should be released, wherever they are caught. This was a big breeder, probably over 7 or 8 years old, and clearly ready to breed again. We released ‘My Shady Lady’ with very little need for swimming, and completely unharmed. I ran a marathon last year, a life goal. It felt very satisfying and it was an achievement. I compare catching this meter plus Barra with that experience, both being adrenaline filled experiences that not everyone gets to experience. They take will, and perseverance, and when accomplished, they feel great. The trip back to the boat ramp felt like the angler’s avenue of glory, and when we chatted to Northern Territory Barra legend, Col Cordingly, on the way back to the ramp, and he congratulated me on breaking the meter mark, I felt sensational. There’s something about fishing I just love. We worked so hard casting and trolling that river for no result. After 7 hours on the water, and on a gut feeling, we explored a small creek on the way back to the boat ramp. In a heartbeat, a slow day then turned to pandemonium. Like life, fishing is an unpredictable venture, and that keeps it interesting. Like running a marathon (as many have) for fun or as a mere personal challenge, when you catch your first meter Barra (as many have), you only compete against yourself. That said, there is a sense of comfort in knowing that my two good mates who joined the club a year ago, can now rest assured that my meter fish was bigger than theirs…Tight lines….Andy.